Perhaps an overlooked aspect of decor, interior lighting is capable of giving life to a room. Many people do not notice how proper lighting can change the feel and size of a room. Moreover, it can easily alter how you view the specific shade of wall paint you chose. Easily adjusted, interior lighting allows you to get the most out of an area, depending on what you need. Furthermore, the beauty of light comes from its versatile nature. 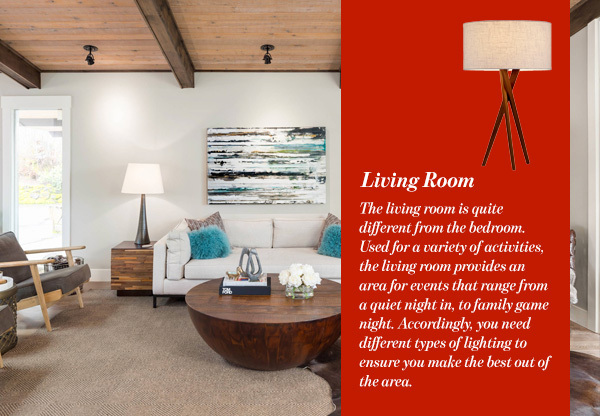 You can use layers of lighting throughout your home, mixing natural light with different forms of interior lighting. The end result will be a fascinating home that embraces and accentuates all forms of light. Of course, every room in your home has a different purpose. This is why it is important to adjust the lighting in order to fulfill your needs. You want your bedroom to feel warm and cozy. No need for glaring lights that will distract you from the room’s true purpose: sleep. Place lighting in a ceiling fan, a flush-mount. or semi-flush-mount light. As for reading, table lamps or wall sconces will work perfectly for you. However, make sure the lamps are not directed straight at the bed. The living room is quite different from the bedroom. Used for a variety of activities, the living room provides an area for events that range from a quiet night in, to family game night. Accordingly, you need different types of lighting to ensure you make the best out of the area. Lighting three of the room’s four corners is recommended. Try to focus one of those lights on a decorative piece such as a painting or a plant. Table lamps and floor lamps work well together, especially if you aim them both upward and downward. Mainly used for meals, it is best to draw attention to the table in your dining room. Place a chandelier or pendant above the table to make it the main focus. Moreover, use indirect lighting in the room for a relaxing atmosphere. 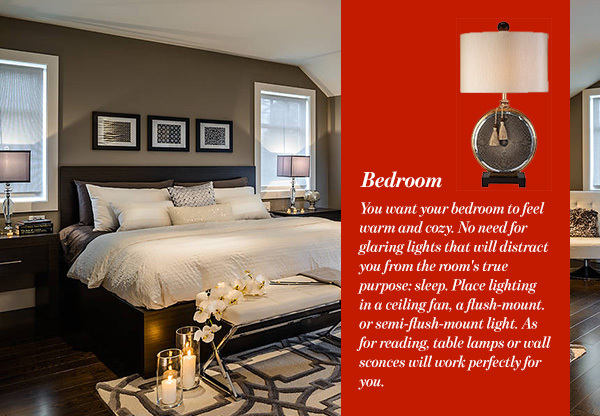 This can be achieved by placing a pair of small table lamps or matching wall sconces. The kitchen is said to be the heart of a home, not only because it’s where food is prepared. 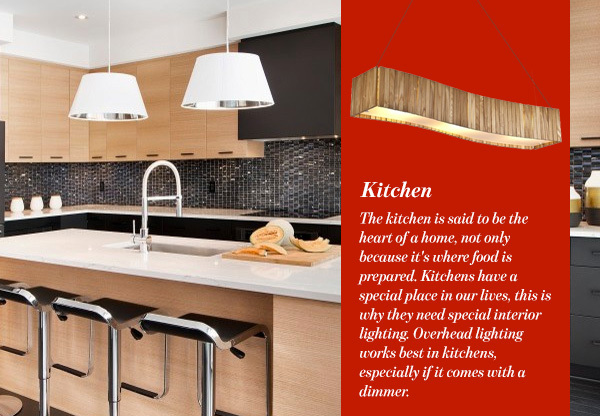 Kitchens have a special place in our lives, this is why they need special interior lighting. Overhead lighting works best in kitchens, especially if it comes with a dimmer. Pendants are also an option. As for cabinets, use under cabinet lighting that will provide additional light and take up minimal space. Finally, we come to the bathroom, where vanity lights above the mirror are still dominant. 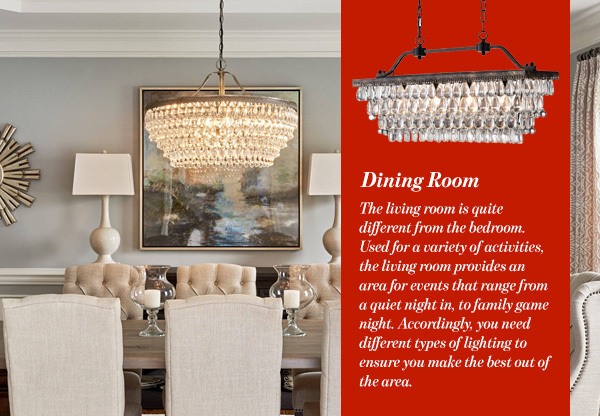 Recently, however, people are opting for a more glamorous look with chandeliers. 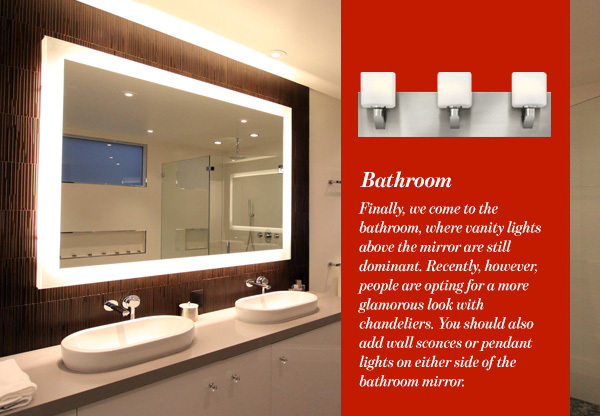 You should also add wall sconces or pendant lights on either side of the bathroom mirror. This will enhance the lighting and ensure that you can carry out tasks such as applying makeup, shaving, or flossing. Lighting comes in three layers: ambient, task, and accent. Generally, it is best to use at least two layers to properly light a room. However, this mostly depends on the size of the room and its type. 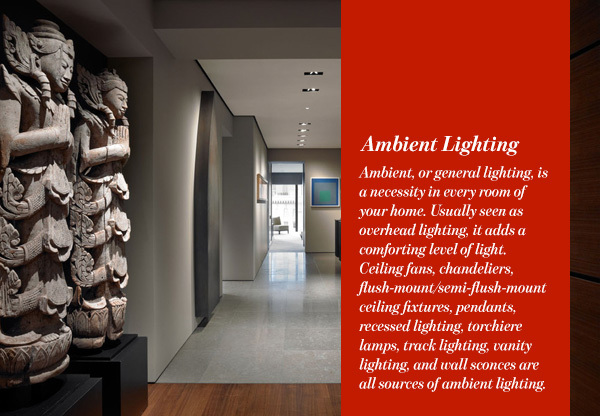 Ambient, or general lighting, is a necessity in every room of your home. Usually seen as overhead lighting, it adds a comforting level of light. Ceiling fans, chandeliers, flush-mount/semi-flush-mount ceiling fixtures, pendants, recessed lighting, torchiere lamps, track lighting, vanity lighting, and wall sconces are all sources of ambient lighting. 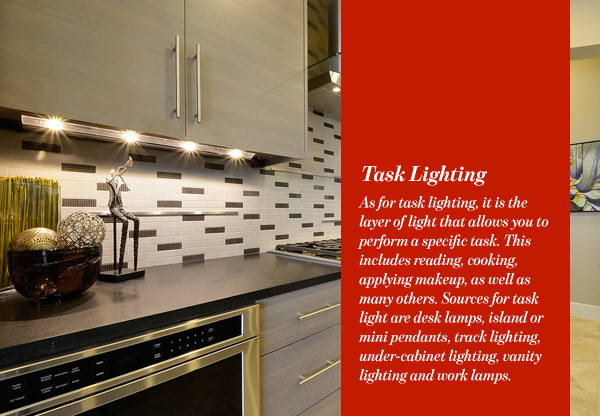 As for task lighting, it is the layer of light that allows you to perform a specific task. This includes reading, cooking, applying makeup, as well as many others. Sources for task light are desk lamps, island or mini pendants, track lighting, under-cabinet lighting, vanity lighting and work lamps. 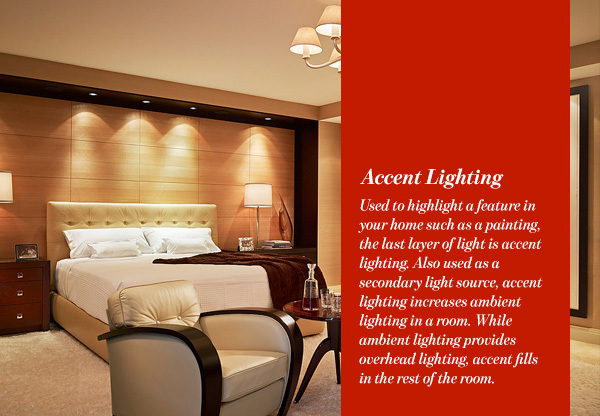 Used to highlight a feature in your home such as a painting, the last layer of light is accent lighting. Also used as a secondary light source, accent lighting increases ambient lighting in a room. While ambient lighting provides overhead lighting, accent fills in the rest of the room. Accent lighting sources include recessed lighting, track lighting, and wall sconces.